Past 10 a.m. on July 7, riot police remove chairs from the front of the NTA’s N1 Gate while protestors remain sitting in them, protesting construction of entry roads to helipads. 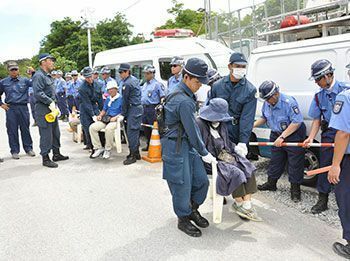 Sit-in protestors held up placards with messages such as: “Don’t destroy Takae” and “Don’t destroy the Yambaru woods.” An Okinawa Prefectural Police riot squad warned protestors not to sit in, and removed chairs with the protestors still sitting in them. The Okinawa Defense Bureau’s security personnel surrounded the gate, allowing about 15 heavy machines and trucks carrying sand and construction equipment to enter the base. Twenty-eight-year-old Takae resident Ayumi Isa said that with Henoko also drawing attention people do not gather in Takae so much anymore, but the fight with construction is not over. She acknowledged that stopping construction may be difficult, but wants to watch closely to see what occurs in Takae.